If you are comming from Angular InstantSearch v1 and you want to upgrade to v2, you can simply use the migration guide. Angular InstantSearch is an Angular 5 & 6 TypeScript library that lets you create an instant search results experience using Algolia’s REST API. Angular InstantSearch is meant to be used with Algolia. Then go on http://localhost:4200/ to see your live example. 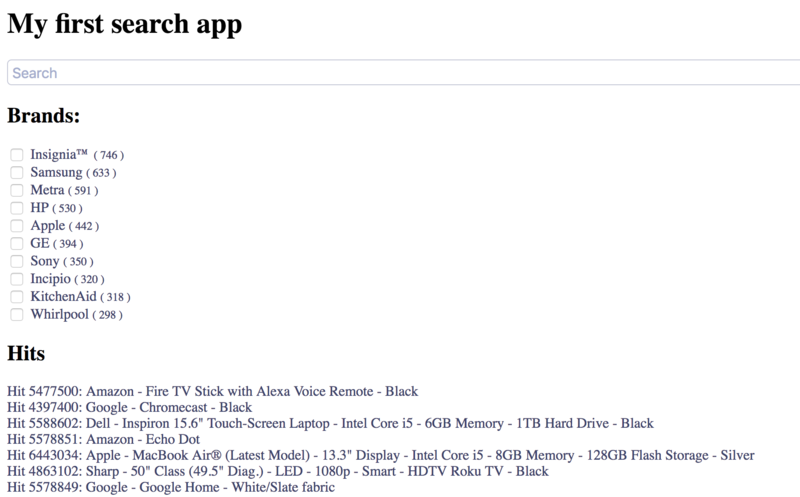 We then need to inject the Angular InstantSearch module into the imports of our app. This can be done either at the root level ( src/app/app.module.ts) or in any search module you might have. When done at the root level of your app, the syntax is a bit different. Finally, kill (ctrl + c) and reload (ng serve) your server. Now that you have imported Angular InstantSearch module into your application, you can use any widgets with their respective directive. <ais-instantsearch> is the component that will connect to Algolia and will synchronize all the widgets togethers. It has to be the root component of every other widgets you will import. Algolia provides a set of parameters for filtering by facets, numbers or geo location. Angular InstantSearch packages those into a set of widgets. The attribute option specifies the faceted attribute to use in this widget. This attribute should be declared as a facet in the index configuration as well. Those two features are implemented respectively with the Pagination, ClearRefinements and CurrentRefinements widgets. They all have nice defaults which means that we can use them directly without further configuration. Congratulations, you now have a fully featured InstantSearch result page. But this is only the beginning! If you want to dig further into Angular InstantSearch, we suggest reading the other guides and the widgets API.